Home / NEWS / Serious Back Pain and How to Deal With It? Back pain is something that everyone has faced at least once in their lifetimes. Most of the people get alarmed when they experience it but it’s not always as bad as it seems. Many back problems are not usually too worrisome and are easily treatable. The more serious causes are experienced by hardly 5% of the population, and some conditions rarely cause severe pain. What to do if you develop back pain? Try to keep on moving around even if you do it slowly. Stay as active as possible, the pain will most probably get worse if you rest for long periods. Try to do some back exercises and stretches so that the stiffness is relieved. Apply heat or cold compression packs to the area which hurts. This provides good short-term relief. Stay positive! People who tend to be optimistic usually recover faster than the people who are not. Exercises/ Physical therapy – Proper exercises recommended by a therapist according to your problem or condition. Manual therapy – Treatments such as massage and manipulation of the spine by physiotherapists. Cognitive behavioral therapy – If you are struggling with the pain and to relieve the stress and anxiety. Muscle strain or sprain in the back due to excessive physical activity, bending a lot, twisting or repeated lifting of heavy objects. Poor posture during sitting, travelling or sleeping. An improper posture is usually the main culprit for most kinds of back pain. A herniated or slipped disc. The spinal disc is a cushion like structure present between two vertebrae. They help to support the vertebrae and allow flexibility and movement. 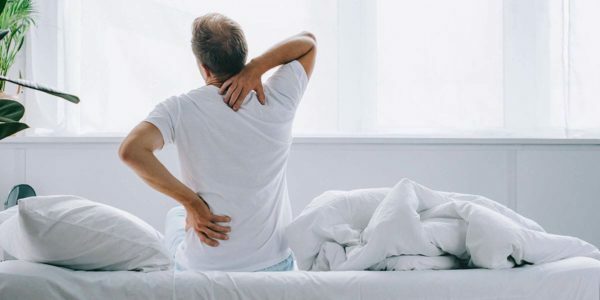 A slipped disc occurs when the disc bulges or ruptures due to excessive pressure on the spine or due to aging, and it in turn compresses the surrounding nerves, causing pain. What makes back pain worse than it already is? There are some very common practices that worsen back pain. These usually go un-noticed because many people are unaware of them and do not consider them important enough. Prolonged sitting. Sitting can put pressure on the spine which leads to stiffness. Incorrect posture while lifting heavy objects. Even if the things aren’t heavy, lifting them improperly can worsen back pain without you realizing it. Educating yourself on the proper way to lift things is very important, especially if you are already suffering from back problems. Poor posture while at work, sitting or standing. Always stand with a tall back, and use back support while sitting or driving if you need to. Not taking help from professionals on time. When you start experiencing back pain, like most people, you will try to get it better by first utilizing home remedies. But never underestimate the help of a healthcare professional like physical therapists. It is better to act sooner rather than later to prevent the pain from getting worse and eventually spending a lot of money later on. Poor mattress. If you do not have a good supportive mattress, it might be worsening your pain without you even being aware of it. Lack of exercise. If you’re not moving a lot during the day, it will stiffen up your spine, reducing flexibility and movement. Performing regular back exercises or stretches are a good way to go. Even taking out time for a walk can do wonders for your back as well as your overall health. These signs do not necessarily mean that something serious is going on but it’s better to get yourself properly examined to confirm that there is nothing to worry about. Healthy lifestyle, good nutrition, and lose weight if you are obese. Use Backrack Spinal Decompression device to safely treat and prevent all types of back pain at home.